De doos van dit spel is licht beschadigd. Het spel is verder in tact en nog niet uitgepakt. Voor foto's neem contact op met de Spelbaron! 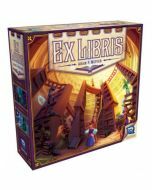 In Ex Libris, you are a collector of rare and valuable books in a thriving gnomish village. Recently, the Mayor and Village Council have announced an opening for a Grand Librarian: a prestigious (and lucrative) position they intend to award to the most qualified villager! Unfortunately, several of your book collector colleagues (more like acquaintances, really) are also candidates.